These are the Perry militia cavalry, sold in the American AWI range but I can't see any reason why they shouldn't be used for un-uniformed Loyalists. Looking at the "British Grenadier!" scenarios, you need militia cavalry for Monmouth (4 figures), Camden (6), Petersburg (3), New Garden (20) and Cowpens (8). The last two scenarios will obviously require some additional figures from other units. There are 2 packs in the range and you can see that there are 3 basic poses in each pack: hunting shirt leaning forward, coat leaning forward and coat leaning back. The figures in the two packs have different headgear and sometimes footwear, so the figures aren't exactly the same across the packs. The right arms are separate so you can customise whether you want officers and buglers etc. I perhaps didn't vary the angle of these arms as I might have done - they are mainly pointing forward in a "charge" position. These are nice, dynamic figures, although they are a fair bit bigger than my Eureka and Foundry AWI cavalry. The metal is quite soft, which means the swords bend easily and the horses' legs need work to straighten them out. I spent longer on the greys than I have done before, trying to capture a more realistic impression of what the coats can look like. Not much more to add, really. The 4th Continental Light Dragoons are next. 6 figures. Painted June - August 2017. Rhode Island was the first of the thirteen colonies to formally renounce its allegiance to George III, in May 1776. The colony then proceeded to raise various regiments of troops as an "army of observation". The 1st Rhode Island Regiment began life in 1775 as "Varnum's Regiment", was then adopted into the Continental Army as the 12th Continental Regiment, was re-designated the 9th Continental Regiment in 1776 and then on 1 January 1777 became the 1st Rhode Island Regiment. 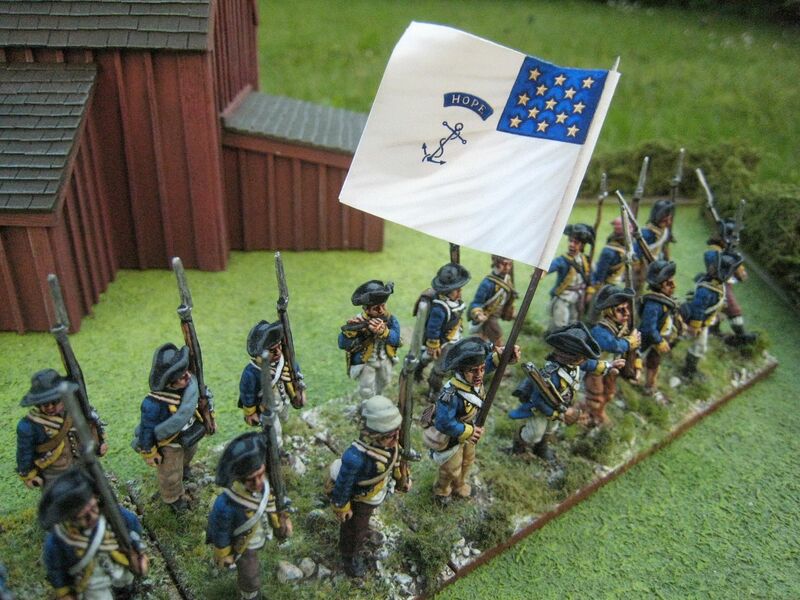 What became the 2nd Rhode Island Regiment followed a similar path: raised as "Hitchcock's Regiment" in May 1775 it joined Continental service as the 14th Continental Regiment, then becoming the 11th Continental Regiment in 1776. 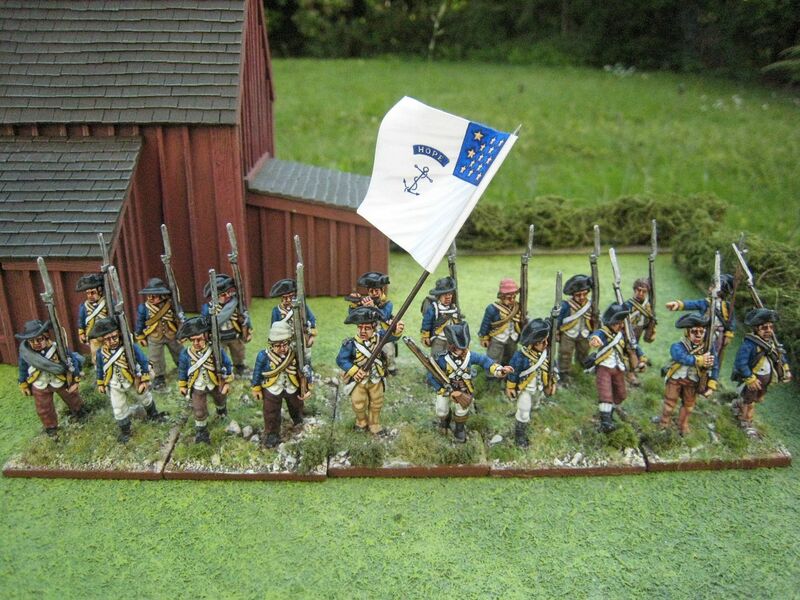 A year later it was re-designated the 2nd Rhode Island Regiment. In February 1778 the 1st and 2nd Rhode Island Regiments merged, and a new 1st Rhode Island Regiment was formed largely of freed slaves. 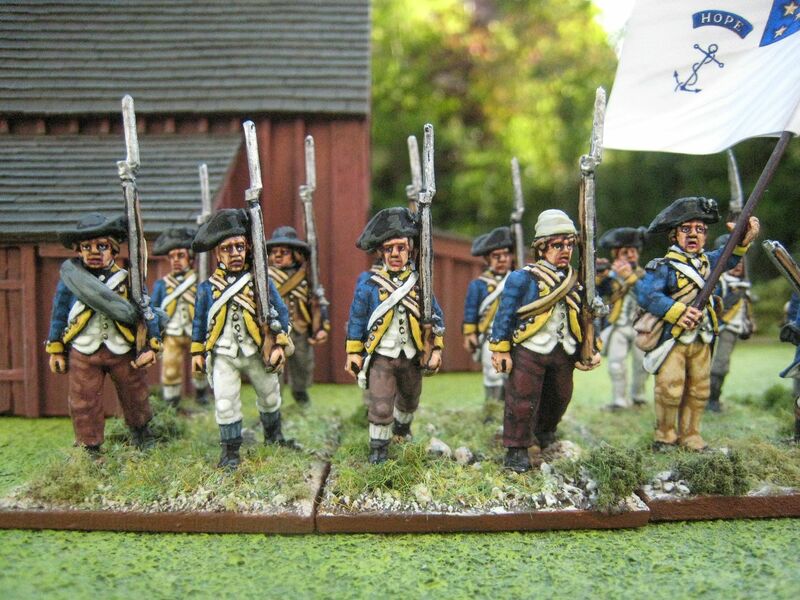 These units appear to have been consolidated into the "Rhode Island Regiment" in 1781. A third unit, "Church's Regiment", was also raised in May 1775 but was disbanded at the end of the year and its men transferred into the other 2 regiments. A further unit, "Richmond's Regiment", was raised in October 1775 and was taken onto the Continental establishment later that year. The unit appears to have been discharged early in 1777. There are also references to another short-lived regiment, "Babcock's" or "Lippitt's Regiment", which was raised in 1776 and disbanded in January 1777. 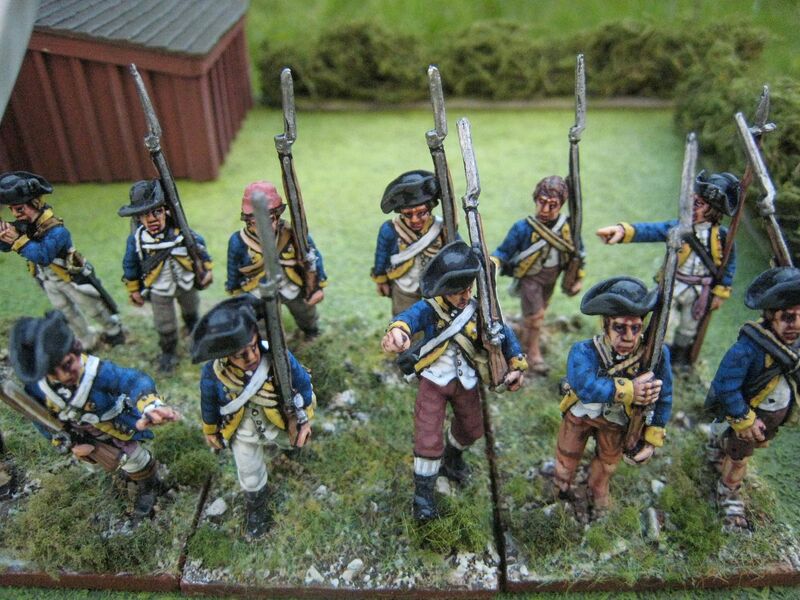 The uniform colours I used for this battalion were taken from the leaflet that comes with the Perry boxed set of Continental infantry. 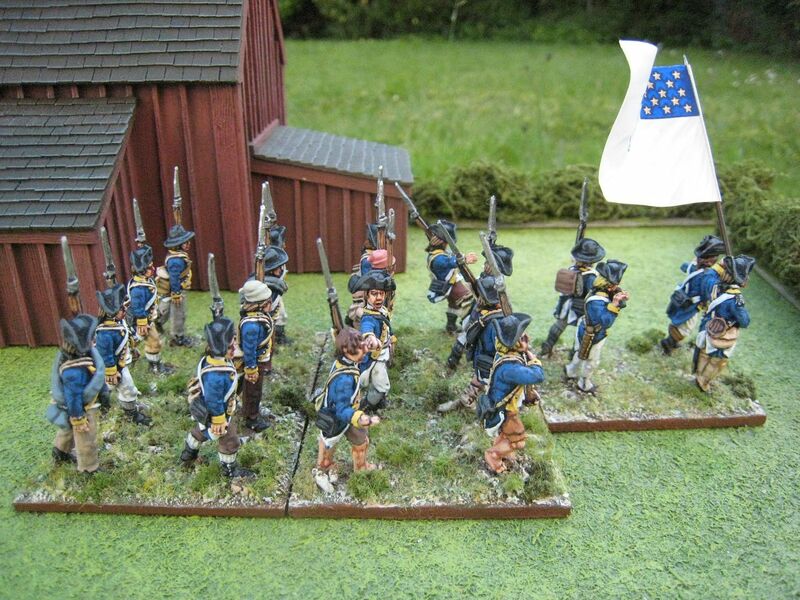 This has dark blue coats faced yellow for the "1st State Regiment" in 1777. I confess I'm not entirely sure which of the five regiments above it is supposed to be. Uniforms changed from year to year in the 1775-8 period and it may be that the blue faced yellow coats were issued to the 1st Rhode Island Regiment in January 1777, or were unique to one of the other units. I've seen references to the 2nd Rhode Island Regiment starting off with brown faced red coats and then changing into white hunting shirts in June 1778. So I'm a bit confused as to this unit's identity but, to be honest, I don't really mind since I like the blue faced yellow coats and this is something different to the more ubiquitous blue or brown faced red. 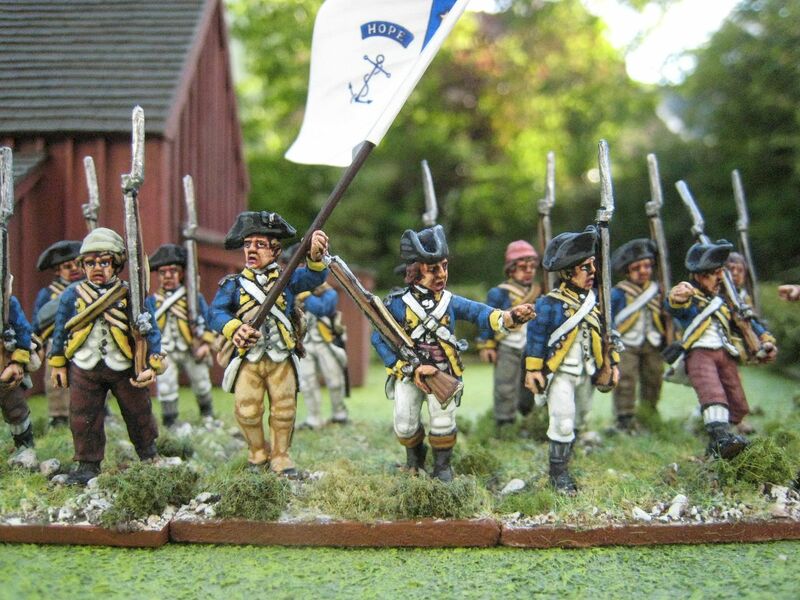 What is clear is that this painted unit is not the later-war "Rhode Island Regiment" in the famous all-white uniforms and fancy leather hats. 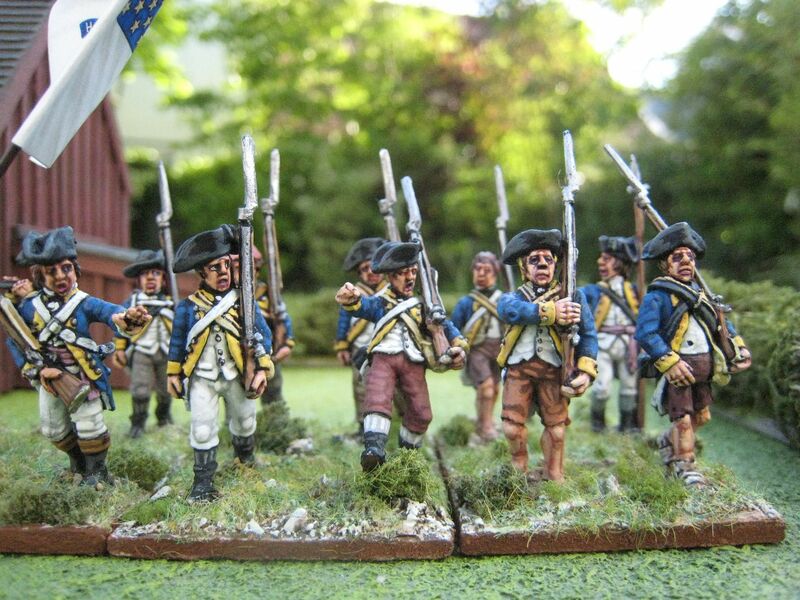 I painted these figures with 1776-78 very much in mind. I painted these figures a good while ago and then forgot about them. A photo of them appears in the fourth "British Grenadier!" scenario book to accompany the Newport scenario. I wanted to use up all my remaining metal "marching" figures, so there are a number of different packs and manufacturers represented here. At one end is a base of four of Eureka's "ragged Continental" figures - this is the company that hasn't received its new uniform issue yet (but are still marching proudly). The blog's been quiet recently for various reasons. I have some more AWI cavalry to post about shortly and then...Napoleon in Egypt week! 20 figures. Painted December 2014 to February 2015. Flag by GMB.